Is Secretary of State John Kerry using the threat of tougher European Union sanctions on Israel to press Prime Minister Benjamin Netanyahu into land concessions with the Palestinians? 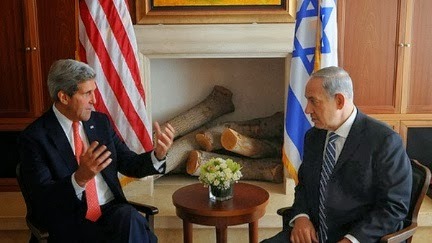 Kerry is in Israel in an effort to advance negotiations between the Jewish state and the Palestinian Authority. Last August, KleinOnline was first to report the Obama administration is working behind the scenes in tandem with the EU's boycott of Israeli settlements, tying the seriousness of the EU's future ban to Israel's actions during current U.S.-brokered talks with the Palestinians, according to a senior Palestinian negotiator. The negotiator claimed at the time that if Israel does not collaborate with the current round of Palestinian talks being brokered by Kerry, the EU financial sanctions could become tougher. The threat has been communicated to Israeli officials, according to the Palestinian negotiator. Now Israel's largest newspaper, Yedioth Aharonot , has reported that Kerry is using the EU sanctions to blackmail Israel into complying with talks aimed at creating a Palestinian state that would include the West Bank and eastern Jerusalem. "And that will only be the beginning. … More and far weightier actions to boycott Israel will follow. They are already being prepared. This will cause incalculable damage to the Israeli economy." In July, the EU published guidelines that deny EU funds in the form of grants, prizes and financial instruments from going toward any Jewish entities in the West Bank, Gaza Strip, Golan Heights or eastern Jerusalem. The guidelines, slated to go into effect in January, further require any future Israeli-EU financial agreements to include a clause stipulating that the West Bank, eastern Jerusalem and the Golan Heights are not actually part of Israel. A senior Palestinian negotiator helping to lead the current Israeli-Palestinian talks told KleinOnline in August that the EU guidelines were published in full coordination with Kerry. The negotiator further claimed that if Israel fails to cooperate with Palestinian talks being brokered by Kerry, the EU financial sanctions could become tougher. Possible further boycotts being considered, the negotiator stated, include an official statement from EU that settlements are illegal; a full financial boycott; and sanctions on all trade, universities and Jewish entities in the settlements. Another possibility is an EU dictate requiring special visas for settlers. On the other hand, if Israel goes along with Kerry's peace plan, the EU will reconsider its current and future settlement boycott, the Palestinian negotiator stated.